Dill fireworks over a cool cucumber salad made a festive presentation for the Fourth of July. A salad that is “cool as a cucumber” evokes a carefree, unperturbed summer. The phrase is an old one, dating to mid-18th century poetry, and always connoted an unflappable attitude, presumably referring to the fact that cucumbers are cool to the touch. 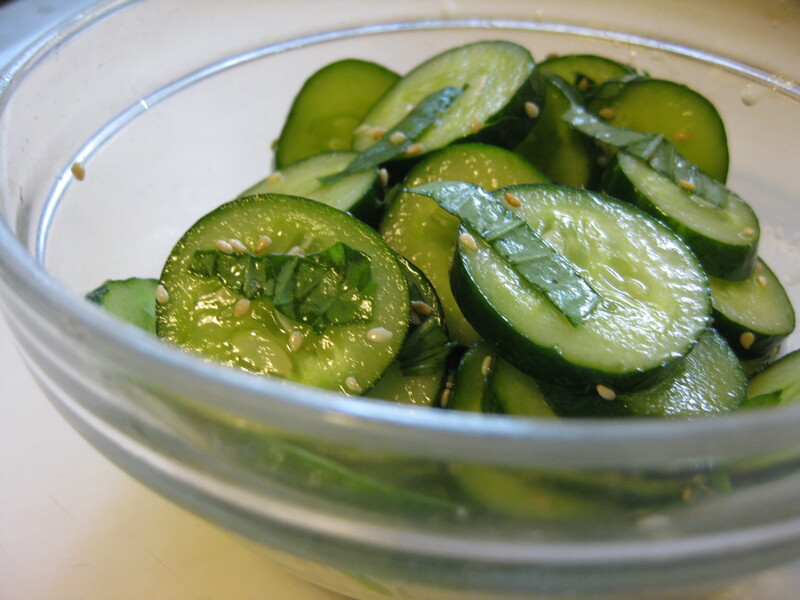 Cucumbers, plentiful in early summer, make refreshing salads. One, a classic, is made of thinly sliced cucumbers with white wine vinegar and dill. Depending on the toughness of the skin, I remove some of the peel in vertical stripes. I slice the cucumbers into very thin slices, salt them lightly and place them in a bowl with a few ice cubes. The salt draws out excess water and bitterness and the ice helps make the cukes crisp. Another salad uses Taiwan cucumbers, cut into chunks, dressed in an Asian-inspired mix of rice vinegar and sesame oil, and garnished with toasted sesame seeds and shreds of Thai basil. Taiwan cucumbers, as they are called at our local farmers’ market, are about 6 inches long, not very seedy and medium-skinned. You can buy them in the grocery store under a different name. Place the sliced cucumber and scallions in a shallow bowl, sprinkle with a little salt, place a few ice cubes on top and let the mixture sit for about 10 minutes. Drain and cucumbers and scallions and toss with a few splashes of vinegar. Add a few drops of olive oil if desired. 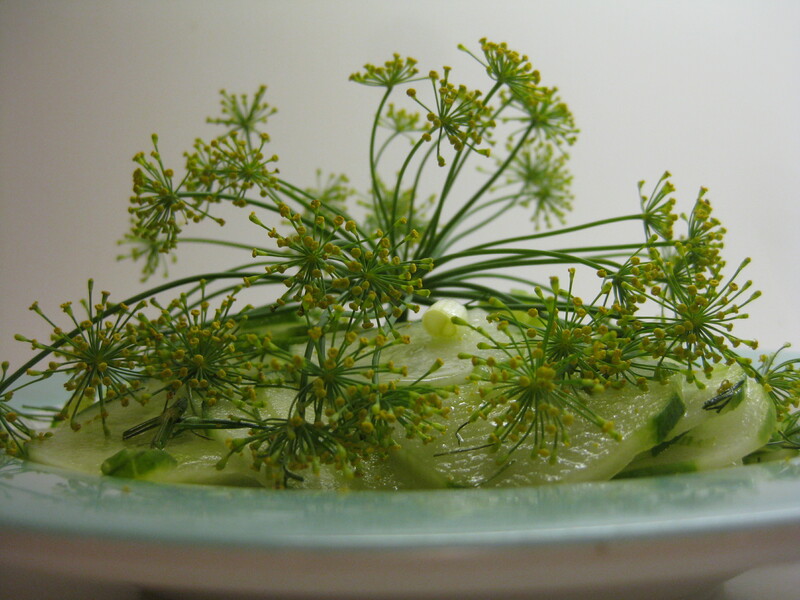 Stir in snipped dill and garnish with dill seed heads if desired. Combine all ingredients. Refrigerate for 10 minutes before serving.